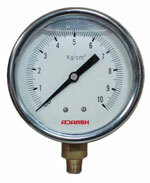 Liquid filled gauges are generally used for applications where vibration & pulsating media is a factor. Vibration leads to wear and tear of internal parts and causes the gauge to damage and an unsteady pointer reading. Glycerin or Silicon filling smoothens the movement of internal gears & parts and also reduces the fluterring of pointer to give a steady reading. These gauges are available with either brass internals or ss internals. Send you inquiry with details like dial size, pressure range, connection, mounting, dry or liquid filled or any other special requirements you have.